Following a head injury, patients typically undergo a CT scan to rule out brain bleeding. A new head worn device that scans the brain’s electrical patterns has shown tremendous promise in clinical trials, presenting an inexpensive way for physicians to make a potentially life-saving diagnosis. The device, called AHEAD 300, was developed by BrainScope, a med-tech firm based out of Bethesda, Maryland. 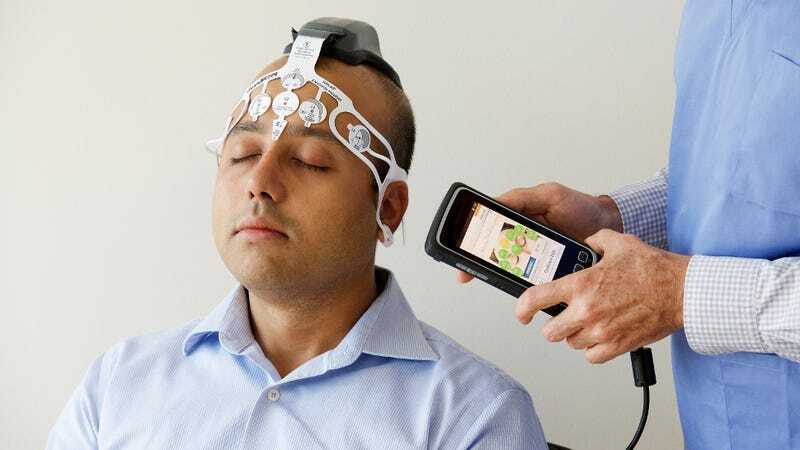 The tricorder-like contraption, which consists of a headset that beams data into a hand-held device, can assess the likelihood that a patient has more than one milliliter of bleeding in the brain, signaling the need for a more thorough evaluation by medical personnel. In a recent clinical trial involving 11 hospitals and 720 participants, AHEAD 300 was able to correctly detect brain bleeding in 97 percent of patients. These results now appear in the science journal Academic Emergency Medicine. No doubt, brain bleeding is a serious medical condition. Doctors call it Traumatic Subarachnoid Hemorrhaging (tSAH), and it happens when small arteries tear during a head injury, releasing blood over the surface of the brain and causing widespread, sometimes fatal, effects. Typically, patients are put into a CT scanner when they show up at an emergency ward following a closed head injury (meaning the skull is still intact). These scans can cost upwards of $1,200 a shot, and the vast majority of patients don’t show any internal bleeding. Ideally, physicians would like to have a cheaper way of making a diagnosis, which is where AHEAD 300 comes in. It took Brainscope eight years to develop the hand-held electroencephalogram (EEG), and it was approved by the FDA in 2016 for clinical use. It includes a disposable headset that records EEG data from five regions on the forehead, feeding these signals back to a hand-held device in real time. AHEAD 300 is capable of reading 30 specific features of the brain’s electrical activity. During an assessment, the system compares a person’s brain activity to the patterns found in normal, healthy individuals. For example, it looks at how slowly or quickly information is transmitted from one side of the brain to the other, or whether electrical activity in both hemispheres is coordinated, or if one side is lagging. Importantly, other data can be entered into the system during a diagnosis, including a person’s age, whether they lost consciousness as a result of the injury, and their current level of conscious awareness. Of the 156 trial patients who were confirmed to have brain bleeding, 92 percent were correctly flagged as having a traumatic brain injury by the AHEAD 300 system. After calibrating the device to be more sensitive to measures that seemed statistically insignificant, the system’s accuracy jumped to 97 percent. “This technology is not meant to replace the CT scan in patients with mild head injury, but it provides the clinician with additional information to facilitate routine clinical decision-making,” he added. BrainScope hasn’t disclosed the cost of its system, but it says AHEAD 300 will be “a fraction of the cost” of a CT scanner, which runs from $90,000 to $2.5 million depending on its features. So far, the system has only been tested on adults, so we don’t know how well the technology works on children and teens. And that’s clearly an area where the company needs to go next. According to the CDC, traumatic brain injuries are the leading cause of death among these age groups.